Peekskill is a sleepy little town up the Hudson River that has undergone decline, renovation and rebirth. It has a real Americana charm. Once a middle-class suburb it is now a burgeoning art community. There is artist housing, and new galleries all set in a prewar town filled with vintage storefronts that inspire images of a former America. But the 21st Century has moved in and Galleries such as Innovative Arts are ready to supply upper Westchester with a hip bohemia and cultural focus. One enters Innovative Arts through a stair well that is hung with the work of Judith Solomon. It is excitingly creative assemblage that promises an artistic experience as one ascends to the gallery. The gallery, which also functions as a studio that offers an array of art classes, has exposed brick walls and is well lit. It is not a "White box gallery" but has a variety of levels and interrupted wall space that offers a nice distribution of art work on view. Innovative Arts fall show is titled THAT WHICH ROARS / Beasts of the Imagination. It is a collection of paintings, sculpture and assemblage that draw upon personal demons. Artists have long been inspired by their dreams and anxieties and worked to give them form which makes it an excellent theme for a show of contemporary artists wresting with some form of inner conflict. There is a wonderful resemblance in Kelli Bickman's work to the paintings of Marie Roberts and other Coney Island artists. It's brash and makes a big "look at me" kind of statement. Like the Coney Island crowd there is an avoidance of fine art issues. Left behind are the years of art history and canons of fine painting and what is left is a raw pictorial instinct. Her THE DEMON THAT SITS AT THE TOP OF THE WORLD is ferocious in both image and color. 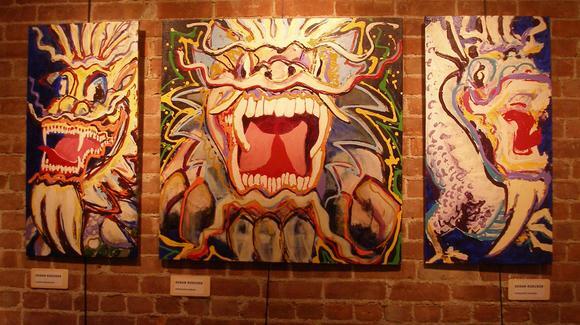 Another of her paintings pictures a fire-breathing dragon that is fierce and at the same time personable. There is a lot to like about her work. Susan Roecker's three panel painting (see above) of the spirochete (Lyme disease) that invaded her over the last year is a creative and engaging solution to dealing with an illness and healing process. She has imaged the debilitating disease that affected her as dragon-like beasts at different times of its engagement. From infection to treatment to the throes of her beast making its final roar, Roecker's paintings are boldly expressive and almost jump off the canvases at you. There is a freedom of the brush as it bounces around this beast in vivid color. I didn't quite get the connection of Robert Barthelmes' lovely watercolors to the Beast theme, but I enjoyed them a great deal. 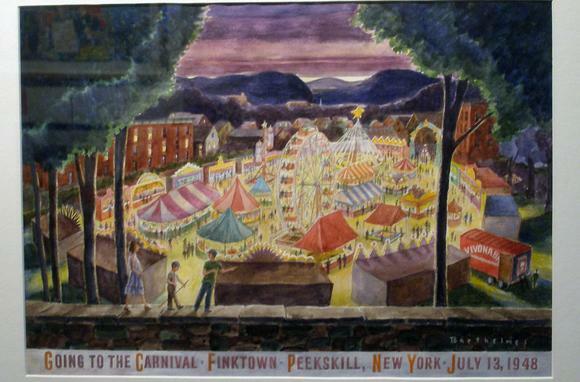 I especially loved his CARNIVAL AT PENELOPE PARK and GOING TO THE CARNIVAL, FINKTOWN PEEKSKILL, NEW YORK, JULY 13,1948 which picture night views of a carnivals set in a small town in the hills. Mr. Barthelmes and I must come from the same generation because his painting brought me back to my youthful excitement of the carnivals and tent shows that visited my hometown during the 1940s. That aside Mr. Barthelmes is a wonderful watercolorist. He perfectly captures the bright lights of the carnivals set in the darkness of a different era. His paintings tug at the heart the same way a Hopper does. Images of a long-gone America set down with technical perfection. I was also intrigued by Deborah Lecce's high-fired ceramic work. Her "Deer" was elegant and beautifully formed. 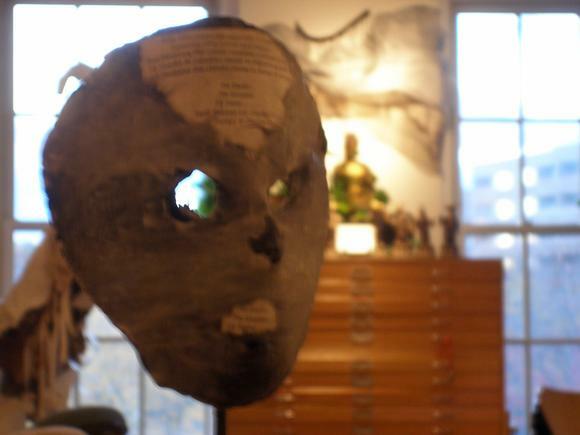 But it was a ceramic mask ('The Masked Poet') that impressed me. From where I was seeing it, it seemed to frame the room rather than provide an alternative identity that most masks do. 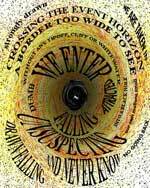 I think it had to do with the eye holes that ones eye was drawn to look through. 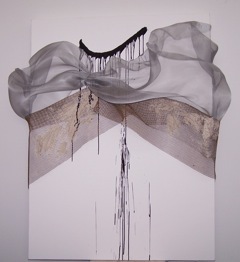 Berenice Pliskin created a political statement painted on silk,very unusual, Her control of the medium was impressive. 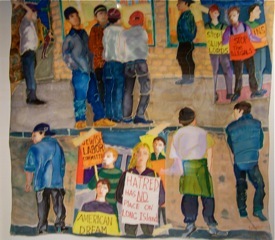 She painted a group of protestors condemning various social inequities. Brian Ben Taylor has a flair for imaginary portraits. They are powerful presences painted in a gifted personal style. There was the work of several other interesting artists which I hope to have the opportunity to comment on at another time. Innovative Arts seems to have no trouble attracting first rate art and showing it with a sense of style.